The firm Ojanguren and Marcaido of Eibar, Spain was founded in 1880. According to Gil Gil Borrallo, they initially concentrated on cheap British Bulldog and Velodog revolvers. During World War I they began to manufacture swing-out cylinder revolvers based on the 1903 Smith & Wesson Hand Ejector. Toward the end of the 1920’s the firm took on a new partner and the name was changed to Ojanguren Y Vidosa. Ojanguren y Vidosa manufactured a Tanque revolver as early as 1928 (possibly earlier). 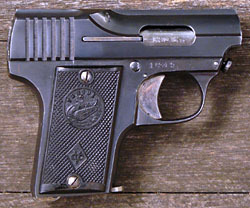 The Tanque auto pistol did not appear until 1932, judging by the date stamp on the barrel, though there may be some doubt as to its authenticity. The Tanque is a hammer-fired inertially retarded unlocked breech self loading pistol. While loosely based on Browning designs, it has some unusual features, the most obvious of which is the takedown button on the front of the frame just below the muzzle. 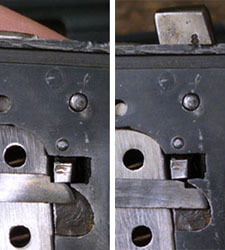 Pressing the button upward lowers a metal block in the forward portion of the frame allowing the barrel to slide forward out of the receiver, and if the magazine is removed the slide may be drawn off the front as well. After taking the gun apart, the next thing you notice is the recoil spring mounted above the firing pin at the rear of the gun, which accounts for the high profile of the slide. I’ve never seen another gun with the recoil spring in exactly this location. released, the spring-tensioned transfer bar moves forward and up, re-engaging the sear. I was surprised that the Tanque also has an excellent magazine safety. 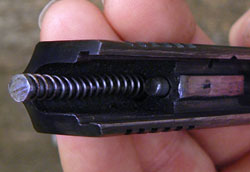 When the magazine is inserted, a lever on the right side of the gun is pushed out to the right side, into a recess in the right grip plate, unlocking the sear. With the magazine withdrawn, a projection on the lever moves into the magazine well, the sear is locked, the hammer cannot be cocked, and if the hammer is already cocked the locked sear prevents it from being released. I can’t speak for the quality of the steel, but the workmanship on the Tanque is good. There are no burrs or sharp edges anywhere inside the gun, and I can’t detect any obvious machine marks. The frame and slide appear to be rust blued. The barrel, hammer, trigger, transfer bar, and magazine release are in the white and highly polished. The magazine is nickle plated. There are matching assembly numbers stamped on the frame, slide, barrel, hammer, and most other small parts large enough to accept them. There are three proof marks stamped on the barrel of my Tanque pistol. I have been unable to find the top and bottom proof marks in any reference for Spanish proofs. The top proof is upside down compared to the other two. It has some sort of figure (it looks like a bird in flight) over the letters PV. In Belgium the lion over PV is the smokeless powder proof (PV standing for “Poudre Vive”), but there is no evidence to suggest that a PV proof was ever used in Spain. The middle proof is an asterisk over the letter “E,” which in Spain is a date mark for the year 1932. The bottom proof is a figure with an OV, which must stand for Ojanguren y Vidosa. One internet source states that the Ojanguren y Vidosa firm went out of business during the Spanish civil war (1936-1939), but I have found a letter on the company letterhead dated 1941. It seems by this date the company had moved into the import-export business, and offered arms, ammunition , automobile accessories, and hardware. 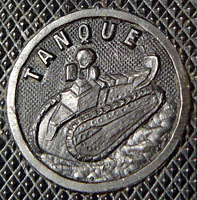 The letter bears the Tanque trademark. 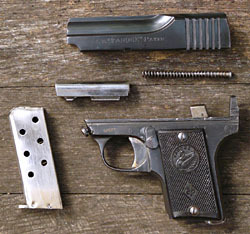 The Crucero pistol is stamped with the OV monogram in an oval on the left grip tang and has identical proofs on the barrel, except the the date mark is an “F” for 1933. The grips are checkered horn with “CRUCERO” across the top and a diamond with the OV monogram at the bottom. Press up on the button on front of the frame. Draw the barrel and slide off the front of the gun. * Thus far I have been made aware of serial numbers 978, 1728, 1831, 2279, and 3541. The Crucero serial number is 1173. Astra Firearms and Selected Competitors, by Leonardo M Antaris. FIRAC, Davenport, Iowa: 2009. Evolución del arma corta en España, by Gil Gil Borrallo. Spanish Handguns, by Gene Gangarosa, Jr. Stoeger, Accokeek, Maryland: 2001. Copyright 2010-2017 by Ed Buffaloe. All rights reserved.